Of all the things I can do in my life I know that the gift of preaching is not one of my strong talents. Just that once in life a person gets that miraculous experience that necessitates some sort of preaching. Today I felt a little compelled to write a little testimony. No, I didn’t just sit down one day and thought this up. It came to me after I heard in church last week that a young woman from the area I used to stay was brutally attacked and raped on her way from a night club. It could have happened to anyone, walking from anywhere and at any time. This brought back some bitter memories for me and happy ones at the same time when I think of how lucky I am. 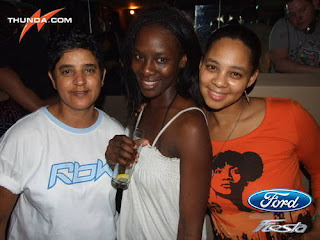 Back in 2009 a friend of mine decided we should have a girl’s night out to the same nightclub. I had reservations about going, firstly because not drinking would mean being the odd one out. It took some convincing and I finally gave in and decided to join my friend and two other girls to Galaxy in Athlone. We got to the club just before midnight. The place was lively with two long queues of revelers waiting to join the party inside. The crowd didn’t surprise me at all, as I had my fair share of clubbing since coming to Cape Town eight years ago. But being reserved by nature I kept asking myself how many in the crowd waited until their parents had gone to sleep before sneaking out? Where any of the young women I saw clad in skimpiest attire some of those irresponsible mothers who waited until their babies went to sleep before going on a night out clubbing. I got very uncomfortable as I stood there in the crowd. My friend who I suspected was already drunk after downing some Irish water to warm up was beginning to get a rowdy. It must have been after midnight and after standing in the queue for more than 20 minutes I asked if she could take me back to my place. When begging and arguing proved pointless, I decided on the improbable - a 45 minutes walk back to my place. It was the first time I had ever been to that side of town but I got my bearings right and started the walk in the notorious neighbourhood of Athlone and Gatesville. Bad things always happen in those parts. Gangster murders, drugs and rapes are just some of the things the place I walked alone that night is famed for. But somehow with no jacket, heels and handbag in my hands I made it safely to my house. This woman who was recently attacked was from the same club and stays just about in the same area I used to stay. I listened with tears in my eyes as her prayer request was read out for the congregation. For me it was a reminder of how Supreme God reigns amid all of our worse situations ever. A young woman was walking alone one night she passed a tree and a man was standing there. Sometime after her another woman came walking in the same path. She was attacked and raped by the man. He was arrest. When the first woman heard the story she went to the police and told them how she went past there shortly before the attack. She asked to see the attacker. She asked him why he didn’t attack her. He said it is because she was walking between two big men. I am sharing this because I cannot begin to comprehend favour I have found in God.